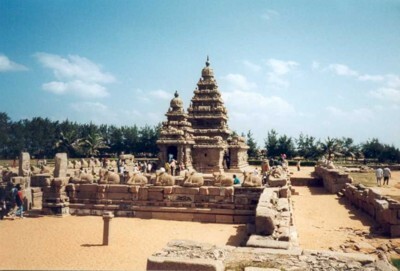 Mahabalipuram (also known as Mamallapuram) is a 7th century port city of the South Indian dynasty of the Pallavas around 60 km south from the city of Chennai in Tamil Nadu. The beautiful cave temples and gigantic open air reliefs carved from blocks of granite date to the seventh century. This group of sanctuaries was founded by the Pallava kings. It is known especially for its rathas (temples in the form of chariots), mandapas (cave sanctuaries), giant open-air reliefs such as the famous 'Descent of the Ganges', and the temple of Rivage, with thousands of sculptures to the glory of Shiva.